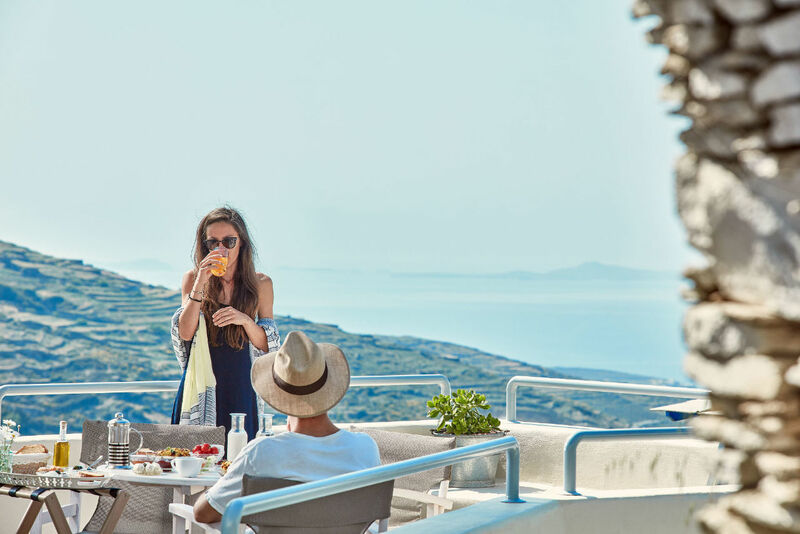 One of the goals at our hotel is to showcase, through the authentically Cycladic hospitality we offer, Tinos’ exceptional culinary tradition. 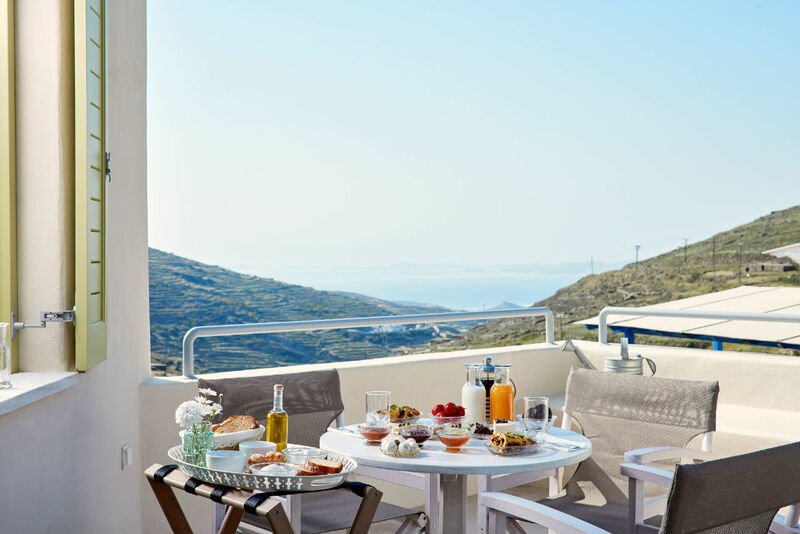 If they wish to do so, Crossroads Inn guests can start their day by sitting down to our hearty Traditional Cycladic Breakfast. It features only the purest and freshest products the land of Tinos yields. 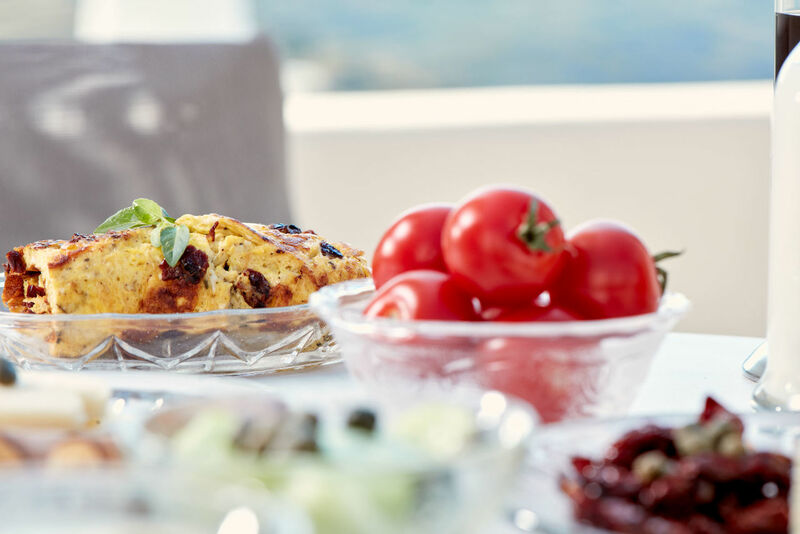 It also offers local delicacies that are worthy ambassadors of the Mediterranean diet as they combine the flavors, aromas, and ingredients of our island’s traditional cuisine. 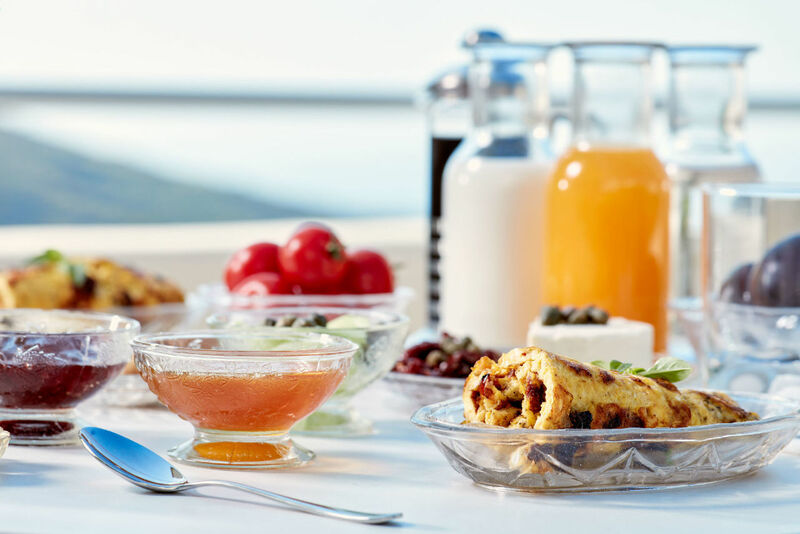 With great love and respect, we prepare daily, only for you, a unique Traditional Cycladic Breakfast that unfolds before you all the tasteful secrets of our land. 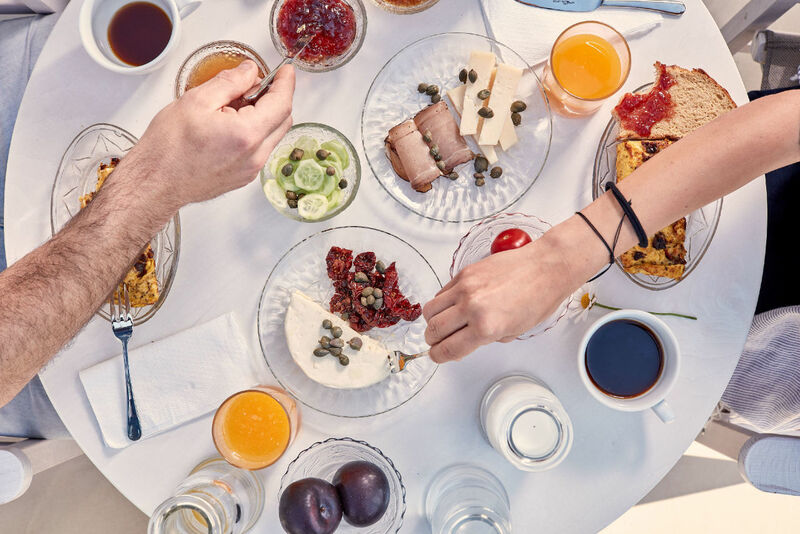 When you sit down to our traditional breakfast, you are actually sitting down with our breakfast’s suppliers. They are not anonymous companies. They are flesh-and-blood people, our neighbors and friends in Tripotamos or the greater Tinos area. So, let us introduce them to you: There’s Mr. Giorgos bringing us our freshly-laid eggs every day from his own cage-free, roaming hens. Next to him are the team members from the Tinos Cooperative who ensure that we only get the best Tinos artisanal cheeses such as our local ‘graviera’. And here is one of the leaders of our daily breakfast parade: Mrs. Eleni. She raises her livestock on the organic leftovers of the celebrated Cyclades Microbrewery at Tinos Island, producers of Greece’s award-winning Nissos beer. 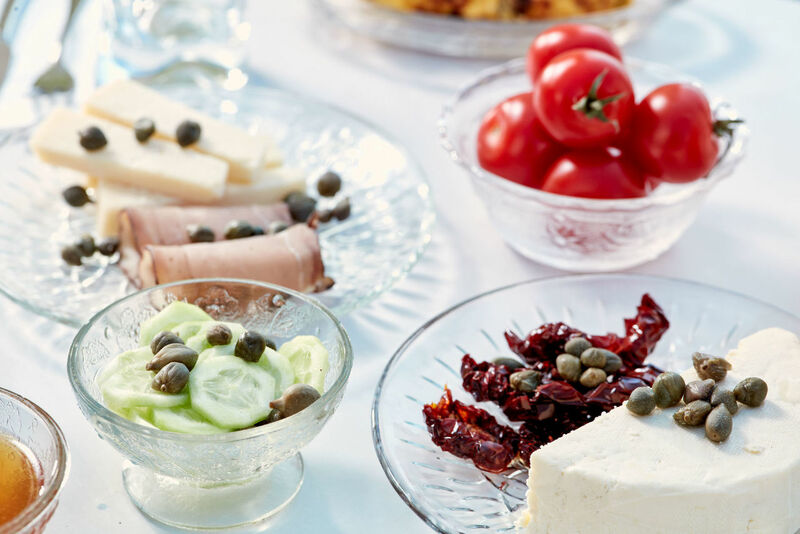 She keeps our mouths watering with her popular cheese balls and many homemade delicacies based on her "secret" recipes and made with Tiniako cheese, locally sun-dried tomatoes, and locally gathered caper buds. She’s also the one who brings us her home-cured louza pork cuts that our guests become as addicted to as we are. Mr. Joseph is sitting with his lovely wife. Together, they take care of their vegetable and fruit orchards from where they come to us carrying vine-ripened tomatoes, small, juicy cucumbers, and seasonal fruit, from the oranges that we make your freshly squeezed orange with to the fragrant slices of honeydew melon on your plate. Next to them, Mr. Lorenz is busy talking to you about his bees and the fragrant, organic honey he brings us. Last but not least, our three, "sweet" ladies: Mrs. Maritsa and Mrs. Eleni with her seasonal jams and preserves such as cherry plum, prickly pear, apricot, strawberry, quince or forest blackberries; Mrs. Maritsa also makes for us the lovely breakfast cakes and her famous lattice-top fruit pies (pasta flora), and Mrs. Rita with her sweet rusks, biscuits, and cookies to dip into your coffee, tea, or milk. The local people we just introduced you to, have been carefully selected with our sole criterion being the respect and care they show for their products and for our island’s tradition. 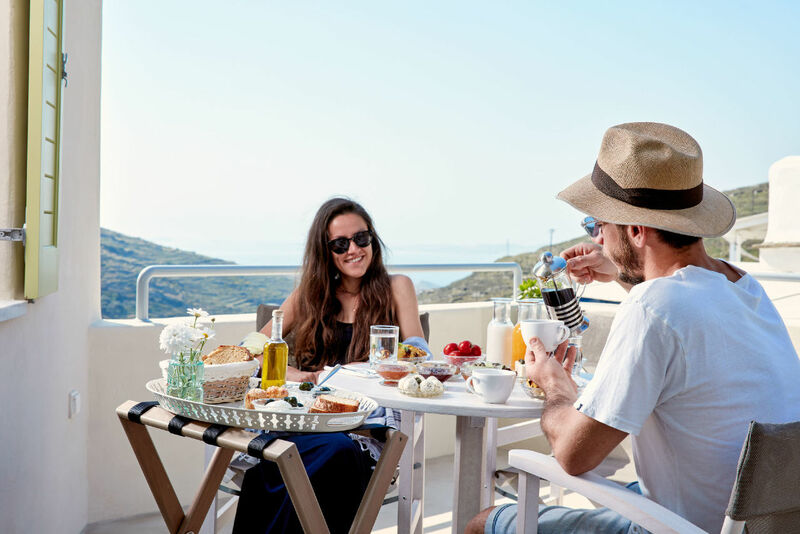 It is the only way we can make sure that quality is guaranteed, that Tinos’ rich culinary tradition takes its rightful place, that the local economy is sustained, and that your breakfast at our hotel is as delicious as it is wholesome. After all, it’s all part of our philosophy here at the Crossroads Inn. We are certain that the rest of your day will be as fulfilling as this traditional breakfast we have just served you. Bon appétit!